The 2,520 feet Shalloch-on-Minnoch mountain is situated 21 miles southeast of Ayr next to the B741 road that runs between the Villages of Straiton and Newton Stewart, by the Stinchar Bridge. The parking areas are about 1,000 ft above sea level, so the actual hike up Shalloch-on-Minnoch from here is about 1500 ft. The large Car Park is just in to the left here. The Stinchar Bridge here is situated 7 miles south of the scenic village of Straiton, next to the B741 road, as seen below. The forest road to the left here is the Carrick Forest Drive, that leads to Loch Braden, Loch Riecawr, Loch Doon and Dalmellington. You can park at this large car park and walk down the main road, over the bridge, about one third of a mile to the large LayBy where this hike begins, or drive down to the LayBy and park there. The image below is from the large LayBy about one third of a mile south of the Stinchar Bridge. You can park a few cars here into the right, close to the edge, and still leave space for passing as there is a passing place at each side of the road, only park on the one side though. The small hill there is the 1,558ft Cairnadloch, 2,162ft Caerloch Dhu behind that, and you may just see the tip of the 2,520ft Shalloch-on-Minnoch behind that. There is a narrow trail that runs down past the sign here to a burn. The image below is of the burn about 50 yards from the LayBy. This may be un-crossable if there has been a lot of rain. There is a faint trail from here to the top of Cairnadloch. Stray off this narrow trail and you will be up to your knees in heather. The image below is from the top of Cairnadloch looking towards Caerloch Dhu. It only took about 15 minutes to get to this point. The trail gets easier to follow from here, a bit soggy in places though, but nothing bad. The image below is from the second cairn on Caerloch Dhu, looking south to Shalloch-on-Minnoch. It took about 40 minutes to hike from Cairnadloch to this point on Caerloch Dhu. The image below is from the low point crossing over to the north side of Shalloch-on-Minnoch. This low point is about 2,030ft, so is about a 500ft hike from here to the top of Shalloch-on-Minnoch. The faint trail leads up where most of the snow is, then runs out when it hits the rocks. It takes about 30 minutes to get to the top. If you want a tougher final hike, cross over to the left in the image below, then hike up the east ridge. Large Image of the East Ridge. If you want an even tougher hike, go round the bottom on the east ridge and up the east side, but that is really steep, and a little dangerous. Large image of the east side route. The image below is of the north cairn on Shalloch-on-Minnoch with the Trig Point further on. You get great views all around from here, the top of Ayrshire, south to the 2,766ft Merrick, west to the Isle of Arran, north to Irvine, and east to the Dungeon and Corserine ranges. 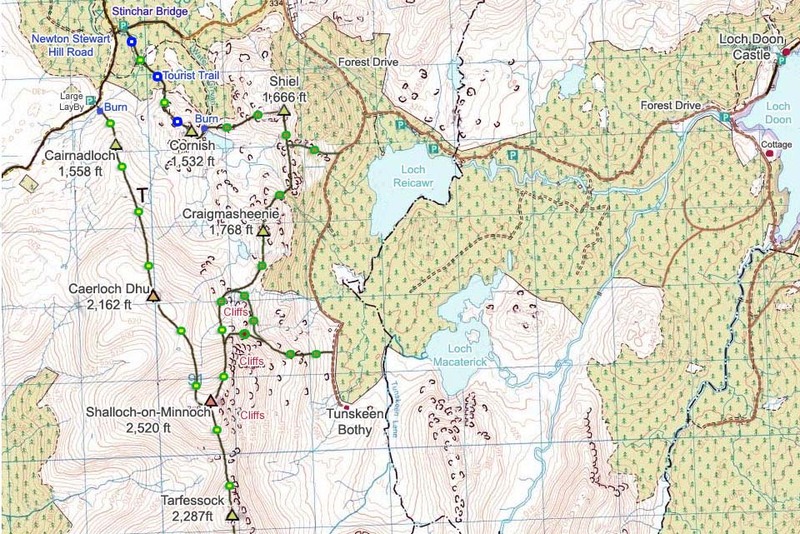 You can hike down all this range to the hiking car park at Loch Trool, but that is a real tough hike, averaging 8 hours, and you need to get dropped off and picked up, or use two cars for that. Large Map of the Range. The image below is from the east side of Shalloch-on-Minnoch looking northeast to Loch Riecawr and Loch Doon beyond that. The Tunskeen Bothy is down to the right in this image. The east side here only has one steep hiking route up, the rest are scrambling routes. 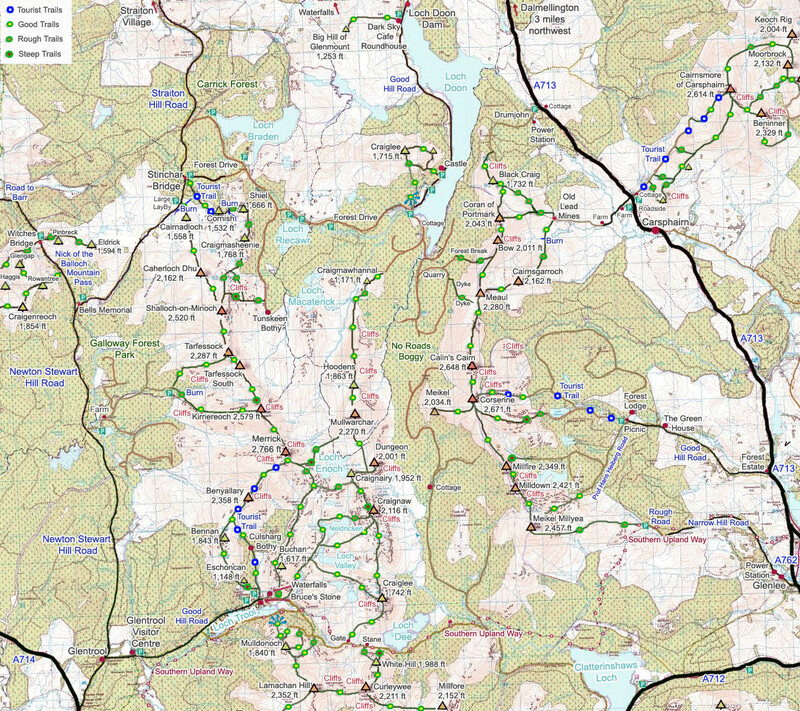 Large image of the route up the east side. The view below is from the north cairn on Shalloch-on-Minnoch looking back down to Caerloch Dhu, back the same way as this photo tour showed the route up. In a clear day, following the trail back down is straight forward. In thick cloud though, it is real difficult finding the trail without a compass. Up here in cloud without an OS map and compass is not advised. The view below is from Caerloch Dhu looking north to Cairnadloch. This image gives a good view of the trail, that is like this most of the way. The view below is from Cairnadloch looking north to the large LayBy and Stinchar Bridge. This route is one of the easiest ways to get to 2,500ft, averaging 1 hour 30 minutes to the top. Doing the loup round Cornish, Shiel, Cragmasheenie, Shalloch-on-Minnoch, Caerloch Dhu and Cairnadloch is a lot tougher, as Shiel and Craigmasheenie are fairly tough hiking. Expext to take between 5 and 7 hours for that route. This can be a great hike for amature hikers, as long as it is a clear day. Avoid the Shalloch-on-Minnoch hike in cloud though, unless you know how to use a hiking map and compass, 2,500ft in cloud can be dangerous.